Many of us find talking about dying hard because we’re afraid of saying the wrong thing. But we know from experience that talking about death can be incredibly positive. That’s why we operate several bereavement help points across the region. 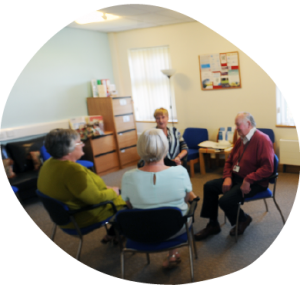 If you are experiencing or have experienced bereavement (regardless of how long ago), you will be made very welcome at one of our free weekly drop-in Bereavement Help Points. There will be information on coping with both the practical and emotional aspects of losing a relative or friend, a chance to chat over a cup of tea with one of our support volunteers and perhaps meet others in a similar situation. For more information, please call us on 01543 434536. Burton on Trent, Staffordshire, DE13 0AR.